Tours are public and run every Friday at 2.00 p.m.
Children must weigh at least 35 kg (77 lbs) and 1.35 m (53 in) tall. Each guide operates with 8 participants. Larger groups will be split up among guides. 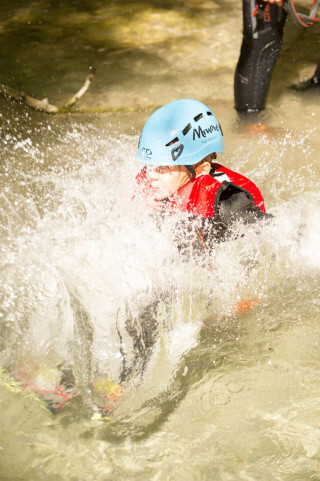 Participants must be active and be comfortable in the water. What to bring: Trainers to walk in the water (no sandals or water shoes) Trekking or strong gym shoes suitable for walking along the paths and in the canyon (it is forbidden to use sandals or open shoes), swimsuit, t-shirt, towel, and change of clothing. No particular experience is required, but must have a good general physical form, be comfortable in water, and not suffer from claustrophobia. Please contact us for information about private tours. 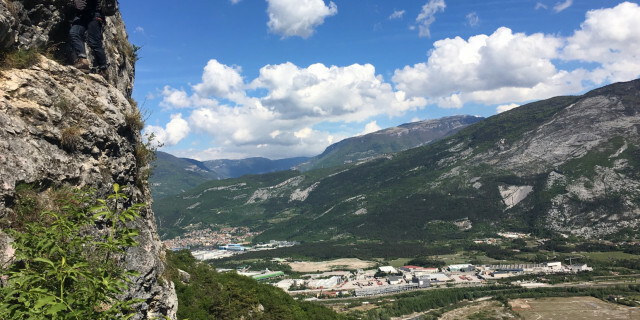 After thousands of years, the flowing water through the Ledro Valley has carved out magnificent rock formations, natural slides, and hidden pools. 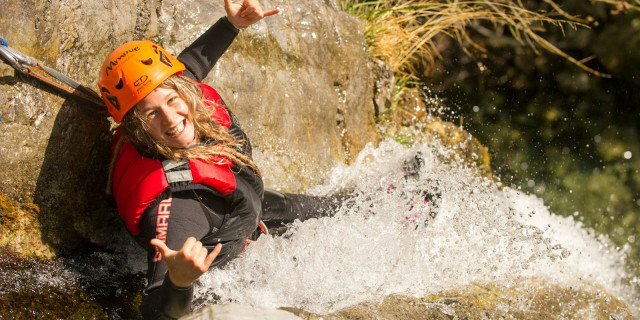 This canyoning adventure through the intricate boulders and rock walls is like playing in a natural aqua playground. 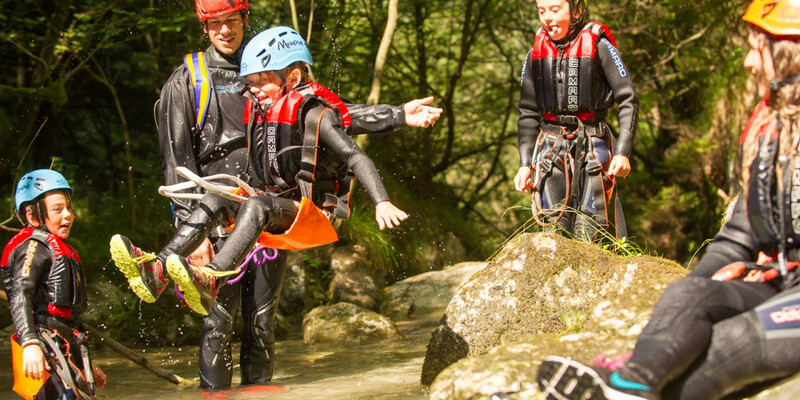 With jumps and slides suitable for children, explore the charm of the canyon's rushing water for a journey that's as fun for the kids as it is for the parents. 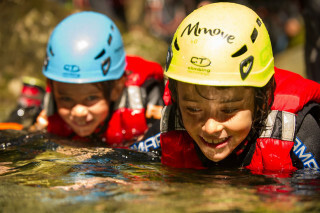 Canyoning involves navigating natural canyons carved out by flowing streams by jumping, sliding, walking, and even abseiling. 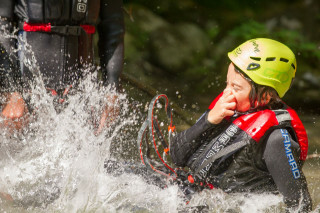 Once you meet your guide, you receive all the necessary equipment including a wetsuit, wet shoes, helmet, and more. After a walk to the activity starting point, a safety brief and introduction are given, and the water is yours! 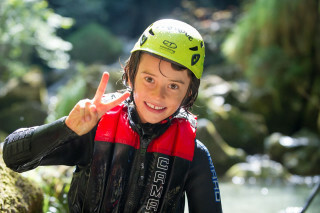 Wander through the river’s stunning natural rock creations with splash after splash. 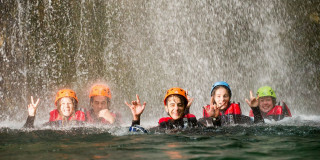 Jump from rock formations and swim through their natural pools. The cool waters and waterfalls provide endless fun and an ideal spot for cooling off in the summer heat. Your guide leads you the entire way, making sure you have fun in the safest way possible. After three hours of water exploration, you walk back to the meeting point to end the excursion. 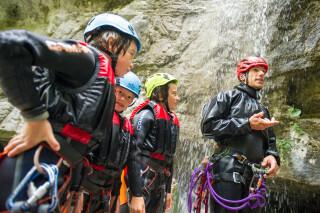 Discover the nature of the Ledro Valley through the thrilling sport of canyoning. The lush green surroundings and unique rocky creations make for an adventure that's just as beautiful as it is exciting.